Alumni News (AN): Can you tell us a little bit about yourself? We’re talking to you because of your outstanding matric results. Was there a lot of pressure in your matric year? AN: I see… so you think learners should start their ‘matric preparation’ early by doing well in lower classes? LP: Definitely. It’s all a build-up and that’s important for everyone to realise – start getting yourself in the right working mode earlier on in your classes. AN: Have you always done well at high school? LP: Umm… I’ve always worked hard and the results showed this. In fact I think this was also a positive contributing factor to my performance. For example – I was under pressure to do well in matric because I was one of the top achievers in Grade 11. So doing well in lower classes helps build up that pressure to continue doing well. AN: You were in the Commerce / Business class (stream) – has learning about money and financial issues always been your passion? AN: I agree money is important – and some of us actually forget this. It also allows you to do many positive things for yourself, family and society at large if you use it wisely and don’t abuse its power. LP: That’s true… but seriously though, I also really loved Mathematics and Accounting. They were some of my favourite subjects so I did well in them. I think that’s how I got the passion. Mathematics gave me the ability to understand figures so this helped me in other commerce related subjects. AN: So can you take us through your matric year? How did you find the studies and workload? LP: Well, the first months were okay as we were getting into the work. The June exams also went okay so I wasn’t too worried at that stage. The one problem we had however was that we struggled with the Accounting teacher. As you know that Mr. Morobe left Tsogo at the end of 2008 so there was a crisis. We got a new teacher but it takes time to adjust to new teaching methods – and we also had to be understood. The bad thing was that as some of us were struggling with Accounting we also started losing confidence that we would do well in the subject. AN: Mr. Morobe’s retirement was a big loss for Tsogo. LP: He’s a very good teacher indeed. But you know Mrs. Mohashoa was a blessing for us! She really came in and helped us. She even organized some Saturday classes for us. There were also other Saturday classes outside Tsogo but I couldn’t attend because they were too expensive. You had to pay R200 to register and then R150 every month….in addition I also had to spend R28 each time to get there and back. AN: So how did you overcome these challenges? LP: Firstly Mrs. Mohashoa was very helpful. We used to ask her for help and this really pulled us through. Some of the learners in my class attended these Saturday Accounting lessons so they shared what they learnt with us. The teamwork and sharing in the class really helped us. I also did a lot more work myself so practicing regularly helped. AN: Teamwork – that’s very interesting. LP: Yeah that’s right – It’s important to work together and this helped us with Accounting last year. The class worked well together. There was also a small group of us who always worked together and consulted regularly with Mrs. Mohashoa. AN: I know you had some challenges throughout the year – specifically, how was life after the June exams? LP: Since I had done well in the June exams I wasn’t too worried. What really got me scared were the mock exams (prelims). I got very scared in September because the exams were very tough. I just thought that if I get similar papers at the end of the year I wouldn’t do as well as I had hoped. This really put pressure on me and I really got working after the mock exams. LP: The other thing for me was that I was still waiting for replies after sending some bursary applications so I couldn’t afford to do badly in matric. That really scared me. AN: Can you tell us a little bit about your bursary application experience? LP: Sure – my brother brought me a pile of bursary applications forms during the year. So I applied to many organizations including Anglo Plat. But even though my Grade 11 results were good most of them didn’t get back to me! The school had also given us some bursary application forms – specifically Mrs. Mohashoa had also given us application forms from Thuthuka Trust which sponsors future Chartered Accountants. In addition to the application form they also wanted us to submit some essays about ourselves and plans – it was bit long so I left it till last (smiles). One weekend I sat and wrote the essay and submitted the application form. LP: I guess. It took a bit long though (laughing) but it was worth it. AN: So how did things unfold thereafter? LP: We had our final Matric Mass in October last year. Even then I had not confirmed my bursary with any organization – so I was a little worried. The closing matric mass was on a Friday and there was a matric prize-giving ceremony afterwards… I got awarded the Top Grade 12 learner which was a surprise. I couldn’t believe it. The University of Pretoria was also there and awarded me a prize which covered all my application and registration fees at UP. Although I was happy to get the opportunity – I always wanted to study BCom Accounting at the University of Johannesburg. The other problem was that UP told me that they had received a lot of applications for BCom Accounting Science so they were suggesting I register for BCom Taxation. I knew I always wanted to do Accounting so I wasn’t comfortable with this – even though I would probably get funding from them as well. AN: It’s always a tough decision isn’t it…. especially if you want to get funding. LP: After the Matric closing mass I spent the weekend studying as we were getting into the final exams. To my surprise on Monday – I received a call from Elsa at Thuthuka and she told me I had been awarded the bursary! It was even better as she told me that I’d be going to study towards a BCom Accounting degree at the University of Johannesburg (RAU Campus). I was very excited! AN: It was the perfect gift just before exams. This must have really motivated you more? LP: That’s right. I was happy because I knew I was going to study exactly what I wanted (BCom Accounting) at the institution I liked! It was very motivating. AN: So clearly that excitement and ‘magic’ went with you into the exam room? LP: Yes – I also think the tough mock exams had prepared me for the finals. I guess I now understand why those exams were so tough. AN: Then you finished your exams – were you nervous about the results afterwards? LP: I was a bit nervous but not too much. On the 1st of December I came to the University of Johannesburg with Thuthuka. It was good to see where I’d be staying, seeing campus and hearing a lot more about the Thuthuka programme. I only started getting nervous as the results’ release date was drawing closer. I remember waking up on the 7th January 2010 hoping that I’d get at least 3 distinctions. I hoped to get 3 distinctions – for English, Maths and Setswana. I loved Setswana and Mam. (Dr.) Lesete’s teaching – so I knew I would do well there. AN: So Dr. Lesete was one of the special ones? LP: Definitely. 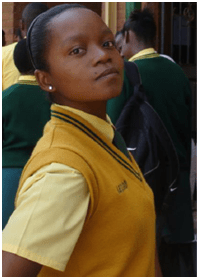 She’s a very good Setswana teacher – so I loved the subject. LP: It was nerve wrecking! I had subscribed for the matric results SMS notification and later on in the morning I got an SMS just saying I had “passed with endorsement”. So I still wanted to see my detailed results. We all went to the school to get our transcripts and detailed results. I COUND’T BELIEVE IT WHEN I SAW MY RESULTS! I thought I might get the 3 distinctions – but 7! It was a pleasant surprise. AN: Wow… 7 distinctions! That must have been a truly amazing feeling? LP: It was a great feeling. I knew then I was ready to go on and face U.J. AN: It must have been unreal packing that suitcase in January and preparing to get to Johannesburg? LP: It was indeed. Very exciting time as everything was about to change. Fortunately for us we stay in a Thuthuka Trust designated residence so it’s only BCom Accounting students on my block. This helps a lot because everyone on our floor faces the same pressures so we don’t really disturb each other. It also helps having people doing the same course next to you as you can always work together. AN: Now you’re on campus. It’s been a few weeks now – how do you feel? LP: It’s been good so far. The one thing is that the workload has changed. It’s a lot more intense now and there’s a lot more to do. I thought matric had a lot of work but university has a lot more! I think Tsogo helped prepare us for this because they used to give us a lot of extra work to do (more than what other high schools in the area got) so we’re sort of used to doing more. But university work is a lot more challenging! I’m also on my own now so it’s about self-discipline and focus – no mom and dad with me. I have to learn to stay on my own so that’s been a bit of an adjustment. It’s good though to have friends from home close by and being in the Thuthuka programme also helps. My friend Tshepiso (also from Tsogo) is also here – and she’s doing the same course. AN: Do you have any words you’d like to share with learners at Tsogo and fellow alumni? LP: It’s important for everyone to know that your background does not determine where you go! Regardless of your background, you have to realise that you’re on your own and only you can determine what happens in your life. Secondly – Know what you want and stick to it! Don’t let other people make decisions for you. I knew I wanted to study towards a BCom Accounting degree and I didn’t allow anyone to tell me otherwise. I think this also helps as I’m adjusting to varsity life… I’m not confused about what I want. AN: So do you have new goals now that you’re done with matric? LP: I’ve just started with my degree so that’s the first goal. I also know though that I want to qualify as a Chartered Account so that’s another big goal for me. AN: Well Lesego we have every confidence in you and know that you’ll do well throughout your years here at RAU (U.J). Do you think the Alumni Society helped in any way in getting you here? For example – you attended the Career and Study expo last year in September. LP: You know over the last few years a few people have explained the process of qualifying as a Chartered Accountant very differently to me. So this was quite confusing for me. I think the expos help to give learners some clarity on various careers and study options. Last year I went to the RMB presentation during the career expo and the presenter (Ms. Isabella Monene – 1996 alumna) was asking us a lot of questions around what’s happening in the financial markets. I remember she was asking us about some deal between MTN and some Indian company. She kept on asking us if we knew about different things going on in the financial world – in China and other areas – and we couldn’t give some of the answers. I think this opened up my mind a lot. It got me thinking about a lot of things I didn’t know. So I think interacting with some former Tsogo students during the expo added value to me. I also got the financial magazines from your (Thabo Ncalo – 1997) presentation so it helped to start reading about financial matters.